Those with a pretty standard WordPress installation and no “subscribe to comments”-plugin whatsoever. Those with some 3rd party comment-system like Disqus or similar, that handles it all for you. Those with the “Subscribe to comments“-plugin from Mark Jaquith (very popular plugin). Blogger #3, which is using “Subscribe To Comments”, knows how important it is to offer your commenters a way of receiving follow-up emails when there’s a new comment, so you can keep them engaged in the conversation. But let’s be honest, how often does a blog post/article turn into an actual conversation? Most of the time, somebody provides a (usually valuable) comment and the blog owner/author replies to it and that’s it. Spam is e-mail you do not want. Bacon is e-mail you do want, but maybe not right now. What “Subscribe To Comments” do, is to e-mail the commenter (if they opt’ed in to receive an email) whenever there’s a new comment to that blog post. Meaning, you could easily receive 10+ e-mails overnight, because other people are commenting on a post you also commented on. A little later, the author decides to reply to each one individually and you have another 10+ e-mails in your inbox. That’s bacon. Imagine doing that at 5 blogs a day and you’ll have 100 e-mails in your Inbox in no time. Thanks to “Subscribe To Comments”. And five of those e-mails are probably a reply to you, from the post author. Five, out of a a hundred e-mails. I’ve been a blogger for almost 4 full months now and I stopped ticking the “Notify me via e-mail of follow-up comments”-box over a month ago, unless I really, really, really want/need to know what other people are writing and/or if somebody decides to reply to my comment. Otherwise, I really don’t have the time to clutter my Inbox with all that bacon, unfortunately. And I know for a fact, if I create a mail rule to automatically fry that bacon and put it into a different folder, then the pile of bacon will just grow so much that I will never be able to consume it and eventually I have to trash it all. Now, the text you see in the above screenshot is not the default text. It’s actually very much the same as the text from “Subscribe To Comments”, which I don’t really understand why that is. I modified the plugin a bit, to make sure commenters understand that they will only receive an e-mail when somebody replies directly to them. If you want to do the same, FTP to your WordPress installation and go to \wp-content\plugins\comment-reply-notification and edit the file comment-reply-notification.php. Be aware though, if the plugin ever gets updated you will lose the change and have to modify the file again. Some blog owners don’t even offer the commenters to decide if they want to receive an e-mail when replied to or not. I know ExtremeJohn.com doesn’t offer the choice, though I’m only 99% sure it’s the same plugin. I think that’s a perfectly acceptable way of doing it and I might even do that too. I mean, I know from myself, that is, if I comment on a blog and the author takes time out of their busy schedule to reply directly to me, I sure as *censored* wouldn’t mind receiving an e-mail about it. After all, blog commenting is not supposed to be a one-way street in the sense that you only comment to advertise for your own blog. If getting an e-mail when somebody (or just the author) decides to reply directly to you, is too much to ask for, maybe joining a forum and comment in there instead, is more your thing, then? But for now, I still offer users the possiblity of unchecking it, though I leave it checked per default (and the “Subscribe To Comments” box unchecked, because I don’t want users to get spammed with bacon, unless they say so themselves). 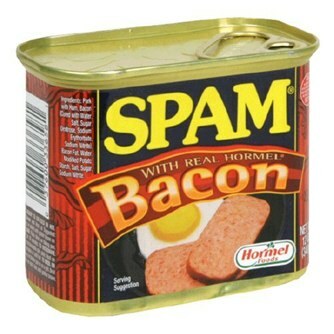 Hmm, spam with bacon, gotta try that sometime! To really take advantage of the “Comment Reply Notifcation” plugin, you need to enable nested comments in your WordPress installation. Go to Dashboard > Settings > Discussion and allow a few levels deep, in nested comments. I’m currently allowing 6 levels. If your theme doesn’t support nested comments, it’s probably an older theme not updated to newer version of WordPress. Consider getting the Thesis theme instead and benefit from a greater Search Engine Optimization too. Now that I’ve used around 850 words to rant about “Subscribe To Comments” ramble on about why I think you should use “Comment Reply Notification” (and congratulations for making it this far, by the way 🙂 ), let’s just quickly get into some of the behind-the-scenes settings of “Comment Reply Notification”. Besides that, you can also edit the subject of the e-mail and the content. You have some placeholders available to customize the message to your likings. You can’t, however, insert a list of your latest 5 posts in case you want to do some extra advertising for your blog. At least not without modifying the plugin even further, directly in the code. 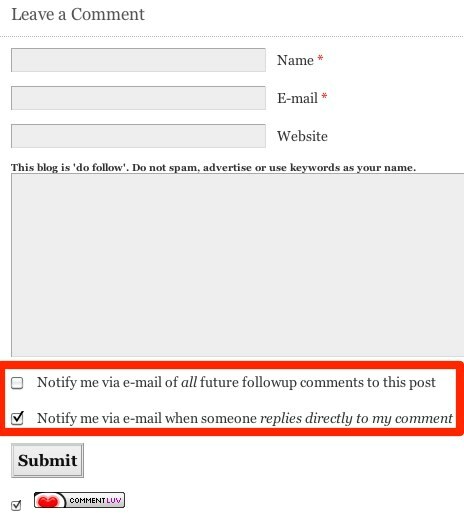 It’s time for you to go visit “Comment Reply Notification” and consider adding it to your blog. If you have already added it, or you plan to do so, please leave a comment below. I can gurantee you that I’ll be ticking that box when I see it on your website, I don’t mind getting an e-mail when somebody replies directly to my comment. Also feel free to comment no matter if you agree or disagree with my views on both “Subscribe To Comment” and “Comment Reply Notification”, all views are welcome! This is an EXCELLENT plugin and excellent post. Wow I wish everyone had this thing. Nowadays when I comment on a blog I don’t ask for any notification at all because of what you mentioned – an inbox so full of spam with bacon bits that I sometimes miss real emails. Thanks! .-= christie´s last blog ..How I got started with my Google Wave Preview! =-. Phew..what a long post 😀 I honestly read half-way and already sold lol. I saw this before on another blog but never really think about the effect like you explained it clearly on the first few paragraphs. .-= Michael Aulia´s last blog ..Weekend fun: A cat betrayed his girlfriend….. =-. As soon as I saw this on your blog, I scoured the internet for this plugin.. It is a must have. It’s very useful for conversations and keeping your commenter(s) coming back! Even I hate when I see my inbox full of spam. Thank you very much for sharing this plugin. I’ll definitely use it at my blog. .-= Ricky ´s last blog ..New wordpress Theme-Redefined Goals At Techgenuine =-. “Comment Reply Notification” Is A Must Have Plugin For our Blog because it gives us the acknowledge of the author whether he/she likes the comments or not. It is so true about the number emails that one can get in their inbox if they are prolific blog commenters. Usually it doesn’t bother me but there are those days where it seems like, BAM, “why is my whole email account full of these comment reply emails”? Of course when you go check them out it’s usually just another comment on the post, which is great, but it’s not really always applicable to you. Plus who wants to “moderate” another person’s blog? LOL. This solves the whole issue and brings you back into conversation. Great share. its a nice plugin.now i am easily deal with spams before reading your post its very difficult to deal with them when you inbox is full of spams.great post. This plug in works like when a reply is made to a comment the user has left on the blog, an e-mail shall be sent to the user to notify him of the reply. This will allow the users to follow up the comment and expand the conversation if desired. It’s interesting you should write an article about this, as I have just this moment before entering your site looked up my post email subscriptions and noticed quite a lot of people subscribed to the actual post itself. The option of allowing users to pick to reply to their own comment is a good idea, for the simple fact that you get users interested in both sides of the spectrum and having that option is always worthwhile. Thanks again for a most needed plugin! One which I definetly shall be downloading. Thank you also for the handy change in the file. Every little helps. Interesting just tested this plugin out and changed the lines under the php file through ftp and had some sort of error after-something to do with my header and the code file appeared at the top of the site. I have just deactivated the plugin to see where the error is. .-= Ana´s last blog ..Alive and Kicking =-. I just had the same thing happen to me. Got some weird code showing up in the header. Had to deactivate the plugin and reinstall as it is. .-= Denise@ How to Make Money Online´s last blog ..Blogger Illustrated: Internet Marketing Defined =-. I might have to check out this plugin, I like the idea of reducing the spam. .-= Extreme John´s last blog ..Best Tanning Salon in Florida =-. I need interesting plug-ins for when I redesign my blog so thanks for the share Klaus. I’m glad you like it and I hope you will be using it at your blog(s) too, will make it much easier and comfortable for the commentators to receive notifications when they’re replied to. Thank you for spreading the word about this plugin! I use it on my own blog, and I wish more people used it! Whenever I comment on a blog, I would love to know if/when someone replies directly to me. However, for popular blogs that get 50+ (or even 100+) comments per post, there’ s just no way I want to get all of those in my email! This plugin lets me do that. I know that some people really do love getting notified for every single comment, so I think everyone should use both Comment Reply Notification and Subscribe to Comments, like you are doing on your blog here! Hey, while I’m here… does anyone know how to change the location of the CRN checkbox? I’m also using the CommentLuv plugin, and I’d like to place the Comment Reply Notification above the CommentLuv checkbox. Thanks! .-= Caitlin´s last blog ..5 Hard Ways to Declutter in the New Year =-. I think this may be enlightening and don’t hear much. This is good info. Fantastic!! 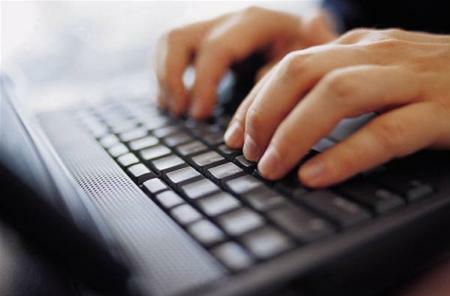 Wow Jeff, this is a great post rich in helpful information about how to boost our blogs! Really great. I’ve bookmarked it and plan to refer back to this often. I want to get all of those in my email! This plugin lets me do that. I know that some people really do love getting notified for every single comment, so I think everyone should use both Comment Reply Notification and Subscribe to Comments, like you are doing on your blog here! b) If I don’t like any comment, can I delete it. Yeah, its great that you can get that plugin and keep tabs with the new stuff that is being said. BTW, I like the spam and bacon metaphor, funny. I commented on one of your posts the other day and I was impressed with this plugin. It’s a great idea and your modifications make it very clear exactly what the commenter is subscribing to. Anyone have experience using this with Wordpress 3.1? Thanks for the post. I also use the plugin now, but I have a problem. I only have one check box below the comment field. How do I get the second to appear? I have chosen this setting: “Commenter choose to do so(default unchecked)”. Appearing below my comment field is: “Notify me of follow-up comments via e-mail” (I’ve changed it into danish, but …). How do I get your: “Notify me via e-mail when someone replies directly to my comment” – to appear as well? I have two “notify” plugins, one of them sends an e-mail whenever someone writes a comment. The other one is the Comment Reply Notification plugin, which I changed the text a bit so that it’s clear people will only get an e-mail when somebody replies directly to their comment. I just changed the text directly in the plugin file, so you need to keep changing it whenever an update has been released (which happens quire rarely, so no big problem). Nice post, Klaus. 🙂 My opinion goes like this: if I comment on something that can create further discussions and the subjects really interests me, then I check the “Subscribe To Comment” box; since I’m curious in others’ views and opinions. When I’m not that interested in taking the discussion further, just want to share opinion with the blogger, then I check the “Comment Reply Notification“ box.